UPGRADE YOUR LIVING ROOM, PATIO OR LARGER AREA WITH THE ULTIMATE PARTY SPEAKER. It not only looks stylish and modern but fills a large room with a dramatically rich sound and punchy bass. Your friends will be amazed and impressed! DENON HEOS Wireless Speaker. Condition is Used. Shipped with USPS Priority Mail. Denon Surround Sound Speaker System. 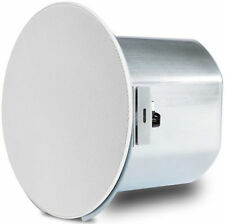 - 1 Subwoofer (DSW-70). - 2 Rear Surround Speakers (SC-A70). Proceeds are used to support local programs and services. - 1 Center Speaker (SC-C70). 5.1 Channel. We promise to resolve your concerns quickly and professionally. 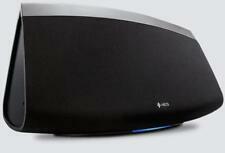 Denon HEOS 1 HS2 Wireless Speaker (Black) (New Version). Condition is Used. Shipped with USPS Parcel Select Ground. 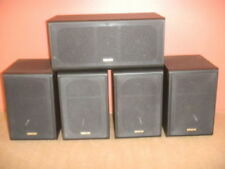 New in sealed box Denon SC-U51 Speaker System. The Speaker Color is Maple Wood. The only thing that identifies it is a Denon are the part numbers stamped on it as pictured. I was going to put it in my JBL Subwoofer cabinet but decided not to and sold the cabinet instead and bought a bigger subwoofer system. Connect your favorite portable device directly to the HEOS 1 via the USB port. Wireless streaming lets you access all the music you love in one place. Includes a mid/woofer and a tweeter. Multiroom compatible portable speaker. 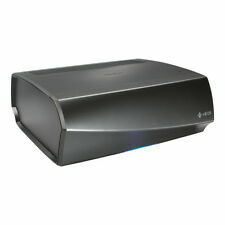 Denon HEOS Wireless Home Amplifier With Bluetooth (HEOS Amp HS2). Condition is Used. Shipped with USPS Priority Mail. Crutchfield customers raved about the convenience of Denon's original HEOS 1 speaker. So how did the company make it even better? They added Bluetooth. Now the HEOS 1 is one of the most versatile wireless speakers we carry. It's small and humidity-resistant, so it goes pretty much anywhere in your house where there's an outlet — including the bathroom. You can play music wirelessly through Bluetooth or connect to your Wi-Fi network for access to Denon's HEOS whole-home music system. 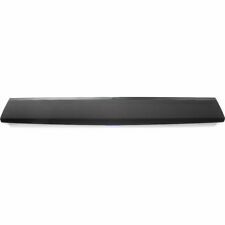 Denon HEOS 1 Wireless Speaker - Black. HEOS1 Wireless Speaker. Once connected via. Local pickup is cash and carry only. For best performance a high quality 12 cm woofer / midrange chassis has been combined with a high definition tweeter and a crossover network with selected components to reproduces the smoothness of natural sound. FEATURES- HEOS 5. ® enabled sources on your HEOS system. Be greedy, you’re covered. ® BUILT-IN - GIVING YOU THE CHOICE OF UTILIZING WI-FI NETWORKS OR BLUETOOTH TO STREAM MUSIC ON THE HEOS WIRELESS MULTI-ROOM SOUND SYSTEM. Have first-generation HEOS gear?. All HEOS components are compatible with each other. Or maybe you have a new music service that's not yet available directly through the HEOS app?. The latest generation of HEOS has you covered. Denon DSW-76 Powered Subwoofer. This is a good working subwoofer. Weight: 26 lbs. Silver color. The rounded rectangular mid-woofer drivers utilize composite Kevlar cones and a double magnet motor system for high efficiency sound and smooth linearity. An advanced 400 mHz 32-bit floating point DSP (Digital Signal Processing) Engine provides clear signal paths for seamless connection between your HEOS devices. Denon SC-M53 Bookshelf Speakers Pair - Nice! Each speaker in good working order! New in Box Heos 5 - COLOR WHITE. Excellent Condition, Very Great Mini Subwoofer. Denon DSW-20 Subwoofer - 8" - Works Great !! Super clean and well cared for. Works great & sounds great. Denon SC-65s Satellite Speakers Sound Great! These sound incredibly crisp and clear. These have wall mount brackets on them as pictured. Pair of DENON USC-08 50W 8-Ohm HiFi Stereo Bookshelf Speakers. Excellent condition. Denon S-302 Right Speaker SC-S302. 100W (Peak). With Denon Stands. Denon S-302 Right Speaker. Model SC-S302. 100W (Peak). With Denon Stands. I'm the original owner. Bought new at Magnolia Audio/Video in Seattle. The speakers functionally perfect. The DVD player was not working, so we stopped using it. This system is previously owned and fully inspected and is in good working condition. There is a large dent on the corner of the subwoofer from the previous owner possibly dropping it. There are surface marks on the bodies from regular use. Dynamic Power: 100W. Power Consumption: 65W. Built-in Bluetooth capability gives you the choice of utilizing WiFi, Bluetooth, Ethernet, USB or AUX input to stream music from your favorite sources right to your HEOS 1 speakers. The sound is optimized via precision acoustical proceeding algorithms that originated in top recording studios. 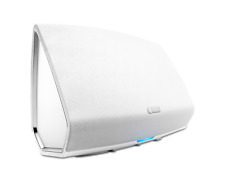 New NIB Wireless speaker ideal for medium to large rooms, HiRes support, Bluetooth Color White S/*N as pictured ..pic 1,2,3 are used item - Demo not the item will send . EAN-13: 0 883795 003513 Amazon ASIN: B00N32HDXO Country of Registration: United States Brand: Denon Model #: HEOS5BK Color: White Weight: 11 Pounds Product Dimension: 14.8 X 13.5 X 9.8 inches Last Scanned: 2018-09-16 15:35:52. DENON: HEOS 5 HS2 *NEW IN BOX* WIRELESS SPEAKER - BLACK. Condition is New. Shipped with FedEx Ground or FedEx Home Delivery. DENON Mini Subwoofer DSW-3L USED, Tested and works! Denon USC-30F Bookshelf Speakers - Work Great !! Very clean and well cared for. Work great & sound great. 100 watts at 6 ohms. Playback choices include: Built-in Dual band wireless, USB Jack, AUX Input, Ethernet for wired networking. Pics are 100% accurate. Works and sounds great . A lot of bass comes out of this little box .